When you find a three-metre snake on the loose, who do you call? The police are not usually equipped for such things, but frightened Florida residents were lucky Detective Emily Shaw was on duty. Cometh the hour, cometh the woman, as Shaw fortunately had just the right set of skills to handle the situation, as she had previously dealt with exotic snakes. 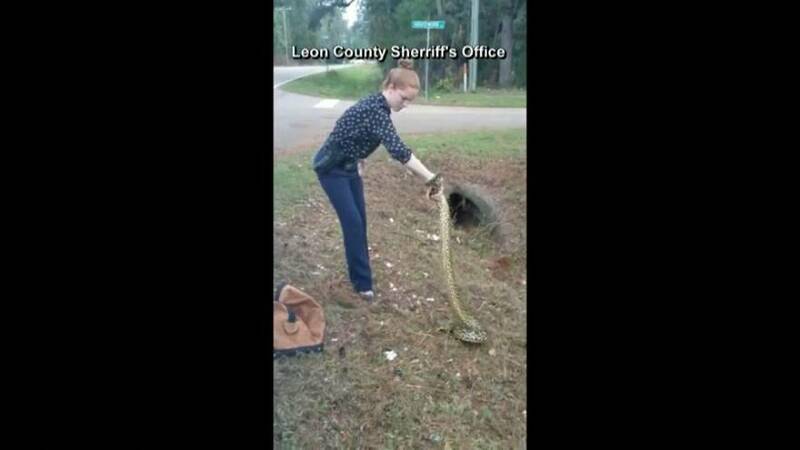 Experts confirmed the beast was a Yellow Anaconda, and Florida Fish & Wildlife officers believe it was someone’s pet that either escaped or was released. It only took a couple of minutes for Shaw to master the reptile, armed only with a large tree branch and what looked like a gym bag. Following the incident the Florida Fish and Wildlife Commission asked to people to be responsible if they owned an exotic pet, reminding owners to ensure cages are completely secure, and if they were no longer able to care for their pets or simply did not want them any more, not to release them into the wild. Instead they should contact the Commission, who would remove it properly and make sure no-one was injured in the operation, or afterwards. Non-native species cost the US some 120 billion dollars a year in environmental damage, and some of the animals released in Florida alone includes Nile Crocodiles, Burmese Pythons, and Green Anacondas. Miami International Airport is a major hub for the wild animal trade, legal or otherwise.